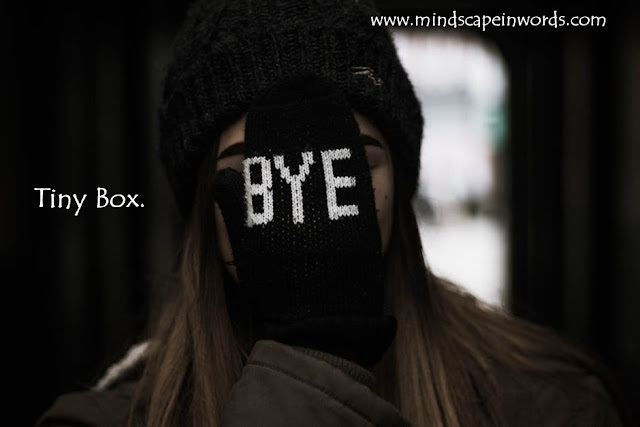 Mindscape in Words: Tiny Box. This is a guest post shared by someone close to me. Give it a read, I'm sure you'll empathise as I did. "When he destroyed me, I decided to remember him by all the wicked things he did to me. No, he didn't abuse me. No, he didn't blackmail me. No, he didn't leave me. He just became someone else to someone, while still being the same to me. I replayed his betrayal in my head every day. I visualised a hell of a future for him. I made myself understand how he was always a horrible person, and how it was my fault for overlooking it. I imagined a miserable life for him. I wished him nothing but failure. But, then there always comes a day. Today, I remembered one tiny detail about him. Stupid, really. It was about his feet. How I liked his feet. And at that moment, it was my decision. I could unlock that tiny box where I had stored all the good things about him. I thought that box was lost in the deepest ocean of my soul. But, when I wondered of retrieving it, it came right at the surface. I cautiously opened it, not wanting it to cause any damage, but it all came back to me in nanoseconds. Thinking about his smile when he blushed. Thinking about the countless times I had seen him cry. Thinking about how he pretended to be badass, but was actually sensitive. Thinking about his irrationality in this already irrational world. Thinking about his instability in this already messed up world. Thinking about why he would've betrayed me after what was supposed to be a wonderful friendship. Thinking about how I remembered tiny details after tiny details, when I hated him with every cell in my body, was shocking. Soon, I realised it was better to close that box because I'd be drowning in those emotions and not just casually swimming through them. And so, that box is locked yet again and hopefully I won't find the need to open it again. I hope it gets lost in the depth of my soul, as are so many other long lost things; a will to live, the lyrics to what used to be my favourite song and the writings of 2 AM." Labels: guest post, life, personal, Rest.. It is really amazing how the details can come rushing back. I recently reread some old letters and all the emotions came back as if it had been weeks instead of decades. It's so easy to open that box and let all those feelings come back, stay strong! Wow what a detailed post. I could feel what you were going through. Stay strong, friend! !